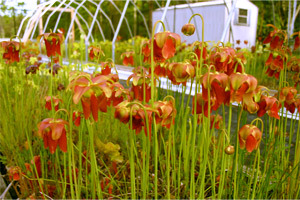 To preserve and restore pitcher plants bogs, and associated ecosystems in Maryland and Virginia utilizing a unique five step process of discovery, propagation, research, reintroduction, and education. To establish a series of nature preserves to protect indigenous pitcher plant systems in perpetuity. Meadowview is a non-profit501(c)(3) organization dedicated to preserving and restoring rare wetland plants, habitats and associated ecosystems on the coastal plain of Maryland and Virginia. Our particular area of specialization is an endangered habitat known as pitcher plant bogs or seepage wetlands. Bogs are acidic, nutrient poor wetlands which are characterized by a unique assemblage of plants and animals. Many bogs have been lost in Maryland and Virginia through drainage, development or neglect and most of the plants found in these sites are threatened with extinction. Our goal is to preserve and restore a part of our natural bog heritage by returning the endangered Yellow Pitcher Plant, Sarracenia flava, and the Purple Pitcher Plant, Sarracenia purpurea, to their historic ranges in Virginia and Maryland utilizing an integrated ecosystem restoration approach. 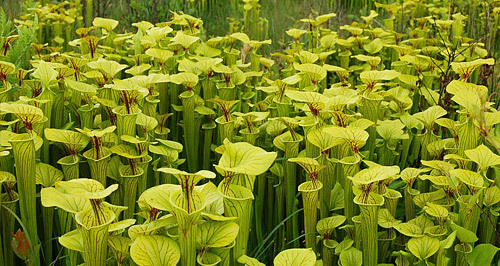 The carnivorous plant, Sarracenia flava, formerly occurred in eight counties in Virginia and is now down to one population totaling less than 100 plants. Our objective is to have at least one viable population in each county of the historic range. We also are developing a system of bog preserves in Maryland and Virginia which will guarantee the preservation of the unique ecosystems supporting the pitcher plant community. Read More. 2019 - Meadowview Job Openings! Looks like we are going to have an Open House at Meadowview headquarters on May 11, 2019. Mark your calendar! This will be one of our big fund raisers for conservation for the year. You'll be able to buy plants, tour the Central VA Preserve, see our operation and much more. Hope you can make it. In the fall we'll celebrate "Conefest" at Joseph Pines Preserve. We invite you to attend an Open House at our Center for Biodiversity and Joseph Pines Preserve. You will see our amazing, restored longleaf pine/pitcher plant ecosystem on our 232 acre preserve and supporting facilities and operations at the Center for Biodiversity. We are soliciting donors to help match our recent Virginia Land Conservation matching grant of $175,000 to purchase an adjoining 190 acres and will be explaining and showing that conservation effort. RSVP requested. Contact meadowview@pitcherplant.org or call 804-633-4336. Meet at the Center for Biodiversity located at 22515 Cabin Point Rd., Disputanta, VA 23842. Check out the event on the Meadowview Facebook page. #GivingTuesday is a global day of giving fueled by the power of social media and collaboration. On November 28 to kick-off the charitable season, please donate to meadowview via our Donate page. To learn more about #GivingTuesday visit their website and use their Add to Calendar feature to place a reminder on your calendar. NEW! Bulk/wholesale pricing on select Sarracenia! $6 per plant for Meadowview Supporting members! Available while supplies last! Wholesale/Bulk rates: $6 per plant if you order 10 or more plants and are a supporting Meadowview member! $12 per plant without a membership. We are selling plants at events every weekend for the rest of September. Come visit us at the following THREE events! Hope to see you! Saturday, September 10, 9:00 am-3:00 pm. A BIG thanks to all of our donors for making the Community Give a huge success. You donated a total of $14,850, and as of this writing, we will receive a $500 prize (we’re still waiting to hear about some other prizes, like the endowment). Not only were we successful in fundraising, but the Community Foundation exceeded their goal of raising over $1,000,000 for regional non-profits. Thank you for your patience with the computer glitches on Give day. This is something we hope we won’t experience again, but we made it through successfully. The money raised from the Community Give will be spent as follows: $6000 for the note on Joseph Pines Preserve in Sussex County, $5000 for the used Polaris Ranger for preserve management, and $3850 for the note on the Central Virginia Preserve in Caroline County. We would like to invite any and all who are interested to attend our carnivorous plant social and open house on Saturday March 19th, 2016 at Meadowview Biological Research Station! There are items that you can donate that would help Meadowview. We are looking for a good, used economy car that gets high mileage; a pressure washer; basket trailer; dump trailer; weed whackers, and Side by side 4 wheeler for preserve managemen. The Cameron Foundation Awards Meadowview $35,000 grant to fund preserve manager and finish second floor educational facility at Center for Biodiversity at Joseph Pines Preserve. Meadowview will be paricipanting in Fall plant sales at Lewis Ginter Botanical Garden and Green Springs Garden Park. More information soon. Thanks to all those that supported Meadowview during the 2015 Community Give. Meadowview has three Restoration Ecologist Internship positions available. They run from May 18 through July 31, 2015 and come with a monthly stipend of $250, free lodging at the Center or headquarters, and garden privileges from the intern vegetable garden. View and Apply for the positions on our Job Openings page. The Online Catalog has been updated with the prices and items for Spring 2015. For more information please visit the Online Catalog. - The Center for Biodiversity Purchased at Joseph Pines Preserve!!! Gift Meadowview a Donation this Holiday Season! Meadowview has successfully purchased the Center for Biodiversity at Joseph Pines Preserve. We would like to thank the Mary Morton Parsons Foundation and the Union First Market Bank for the mortgage loan. Meadowview has received a letter from the Mary Morton Parsons Foundation awarding us a $50,000 challenge grant towards the purchase of the $449,000 Schwartz tract education and biodiversity center at Joseph Pines Preserve. Only $400,000 more needed to purchase the property. This match must be made within one year. Crowd fund raising for the Center for Biodiversity at Joseph Pines Preserve is May 6. We're enrolled under the Community Foundation of the Rappahannock River Region. Please visit the Community Give website for more information and donations can be completed below. We received a letter from the VA Dept. of Env. Quality State Water Control Board on Friday authorizing our $449K loan for the biodiversity center at Joseph Pines Preserve. The loan is contingent on donor or foundation support. A good start is our $50K challenge grant for this project from the Mary Morton Parsons Foundation. This is an excellent place to donate if you, or anyone you know, wants to make an end of year donation. For more information please read this document. For more information please read the letter. Thank you for your support and interest in the work of Meadowview Biological Research Station. Please take a look at our fall 2013 newsletter to read some of our accomplishments and activities this year. We’ve got even more to tell you about in upcoming newsletters and I think you will agree this is an exciting time for Meadowview. We really need your financial support for the upcoming winter. The continued growth and success of Meadowview has resulted in increased operating costs. Our working funds are largely provided by plant sales and revenue in that arena has remained level. Your support, therefore, is even more important to sustaining our organization, especially over the lean fall and winter months. We’re hoping to raise $5000 in member donations to cover operating expenses over the winter. Please think of us in your charitable giving and let others know who might want to help. You can donate online. Both of our nature preserves continue to grow in scope and size and are playing a dominant role in protecting endangered pitcher plants and their associates in Virginia. We were able to perform a prescribed burn in May on 200 acres of the Joseph Pines Preserve. This burn included 100 acres of the recently acquired Posey tract and we are looking forward to the new bog habitat that will be available for reintroduction of rare species. We invite you to schedule a visit to see our headquarters, National Sarracenia Collection, or preserve system. Please let me know if you have any questions and thank you again for your support. Come join us for guided tours of the last great refuge for native pitcher plants in Virginia at the Joseph Pines Preserve in Sussex County. The preserve represents an aggressive attempt at restoring an indigenous longleaf pine/pitcher plant ecosystem through an ambitious reintroduction effort. The waterwheel plant is a globally rare carnivorous plant and our keynote speaker, Adam Cross, will talk about his research with this species. Adam has published a new book on Aldrovanda which will be available for sale at the event. Presentations will also be given by Mason McNair and Jacobo Rozo on Searching for Carnivorous Plants in North Carolina. There will be vendors, a Central Virginia Preserve Tour, an evening social, and more. Learn more about this even and register. Join us for a talk by Christian Dietz and Claus-Juergen Lenz about their trip to Western Australia in 2011. They will lecture about the carnivorous plants they observed including tuberous and pygmy Drosera (Drosera tubaestylis, D. zonaria, D. stolonifera, D. pulchella, D. scorpioides, D. gigantea), Utricularia (Utricularia menziesii, U. inaequalis, U. multifida, and U. tenella), and Cephalotus. They will also show some pictures of the amazing landscapes, animals, and other plants. The talk will be held at the headquarters of Meadowview Biological Research Station at 8390 Fredericksburg Tnpk. Woodford, VA 22580 at 3:00 P.M. on Friday June 14, 2013. Refreshments and snacks will be provided after the lecture. Space is limited so reservations are required to attend the talk. Contact Dr. Phil Sheridan at meadowview@pitcherplant.org or phone 804-633-4336. If you can't join us in person; this talk will be streaming live on this page at 3:00 pm EST 14 June. Join us for a symposium on the ecology and cultivation of the waterwheel plant, Aldrovanda vesiculosa, at Bowling Green Town Hall in Caroline County, Virginia on Saturday June 29, 2013. The waterwheel plant is a globally rare carnivorous plant and our keynote speaker, Adam Cross, will talk about his research with this species. Adam has published a new book on Aldrovanda which will be available for sale at the event. Additional speakers are invited to present at the symposium. The event will also focus on the efforts of Meadowview Biological Research Station to preserve the northern most pitcher plant bog in Virginia at the Central Virginia Preserve. Tours of the preserve will be available. Stewart McPherson has organized three Nepenthes expeditions to take place in 2013. The expeditions are excellent value, and professionally organised with first class logistics, food and expert Nepenthes guides. The expeditions also raise funds to support Meadowview Biological Research Station and the Ark of Life rare Nepenthes collection to further conservation of endangered Nepenthes species. So your participation will directly support the conservation of rare carnivorous plants. © Copyright 2018 Meadowview Biological Research Station. All Rights Reserved.